If you visited the Gili islands over 2 years ago, you may have noticed that everywhere and everyone used to use plastic. No question asked, your purchase would be put in a plastic bag, your drink served in a plastic cup with straws flying away with the wind. 2 years ago there was little understanding of these issues in the wider community and some caring business owners decided to take action. To maintain this little paradise that we called home, many started to implement their own sustainable solutions. Slowly but surely, little initiatives here and there showed up. Remove the plastic bags, ask before giving a plastic bag, saying no to the straws, switching to bamboo straws, recycling plastic bottles and cans. On Saturday’s all kinds of activities were organised, from beach clean-ups to upcycling workshops. Gradually the island started to reduce its use of plastic in general. One thing was undeniably obvious. People were pointing out the big problems and were trying to find sustainable solutions. It was the beginning of something. Something big for Gili Air. Our dream was to create a project that would focus on maintaining the beauty of our home, & implement sustainable solutions for the development of the Gili Air. We wanted to give something back to the island that gave us so much and create a plastic free paradise for the generations to come. Four Main Projects become the Roots of our Plastic Free Paradise Campaign. And after officially one year, the results are in! Inspired by a refill project in Bali, we decided to introduce a refill my bottle initiative to significantly reduce the amount of plastic water bottles used. The principle was simple; businesses around the island who wanted to help, could become a water refill station where people can refill for free or for a small fee. Instead of buying a new bottle of water every time, you can just refill it. Saving money and making a huge difference to our little island. Considering that everybody drinks at least 1.5 litres of water per day, after only a few days, it becomes a very considerable reduction of single-use plastic consumption. 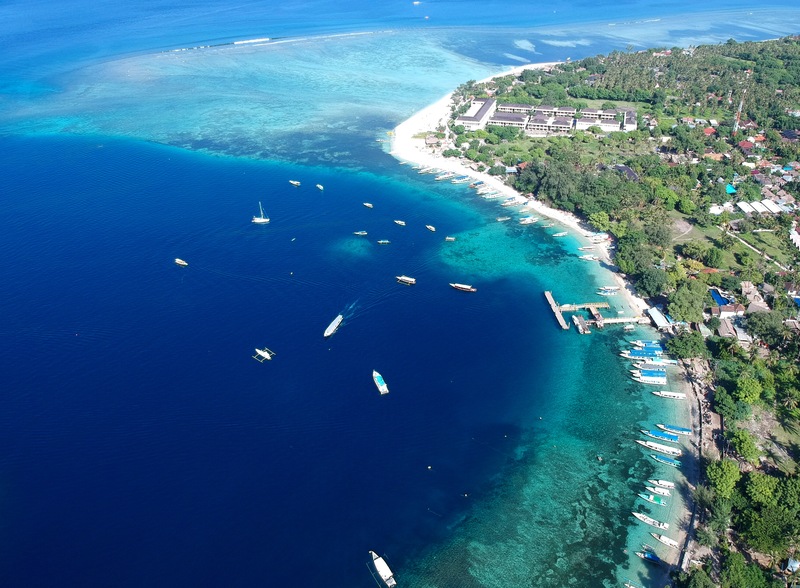 There are now more than 65 businesses proudly supporting Refill Gili. Things are just becoming easier and easier for everybody to only refill their bottle rather than buying a new one. With new businesses opening regularly, it became obvious that not every employee had the knowledge of what it meant to be eco-friendly or an awareness of the impact of non-sustainable business practices on the island. Our Plastic Free Training provides a guide to easy plastic-free alternatives that everyone can adopt. 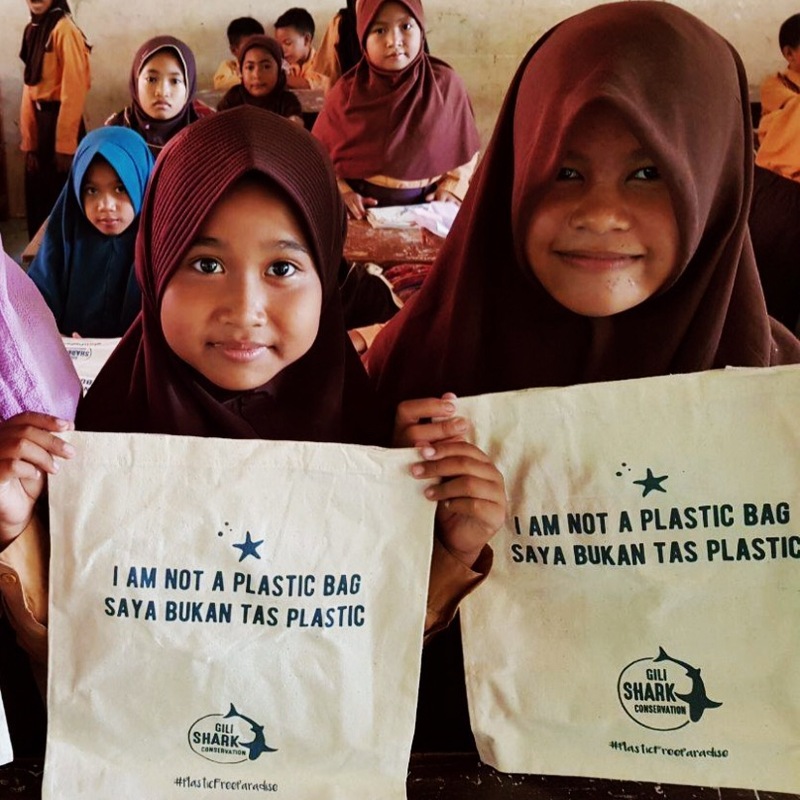 The #PlasticFreeParadise training is giving in Bahasa Indonesia and is for free for all businesses located on Gili Air. To date, 10 new businesses have taken the plastic-free training. Their responses have been nothing but positive. 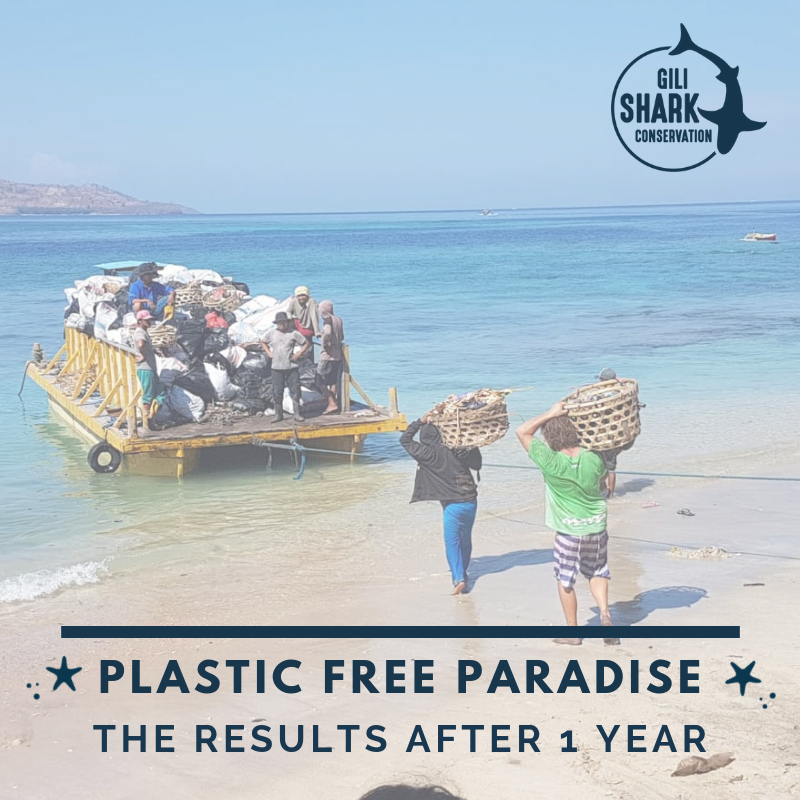 We hope that more and more business on Gili Air will contact us and schedule a Plastic Free Paradise training for their staff. Every Saturday morning at 7h30 you can find us at the local school teaching the students about the wonderful world of conservation. Harapan means hope for the future in Bahasa Indonesia. We believe that with the right knowledge and tools, this next generation will have a great impact on the future, making better choices regarding diverse lifestyle habits and maintaining their paradise. Club Harapan has now officially reached 67 members. And 15 classes have been delivered, divided equally between cleans-up, up-cycling, single-use plastic reduction and protecting marine life. 40 kids have a full membership card which means they attended all the conservation classes required to earn their environmentally friendly rewards which include a reusable shopping bag, a reusable water bottle and a bamboo straw. Every month, we publish a monthly calendar that collates all the conservation activities organised by the various businesses on Gili Air, to make sure you are not missing out on anything! From beach clean-ups to up-cycling workshops, special guest lectures and dives against debris, there’s something for everyone! Our research team attends as many activities as possible as well as hosting our own! Certified divers are welcome to join our Dive Against Debris every Friday morning on our adopted dive site, Meno Slope. 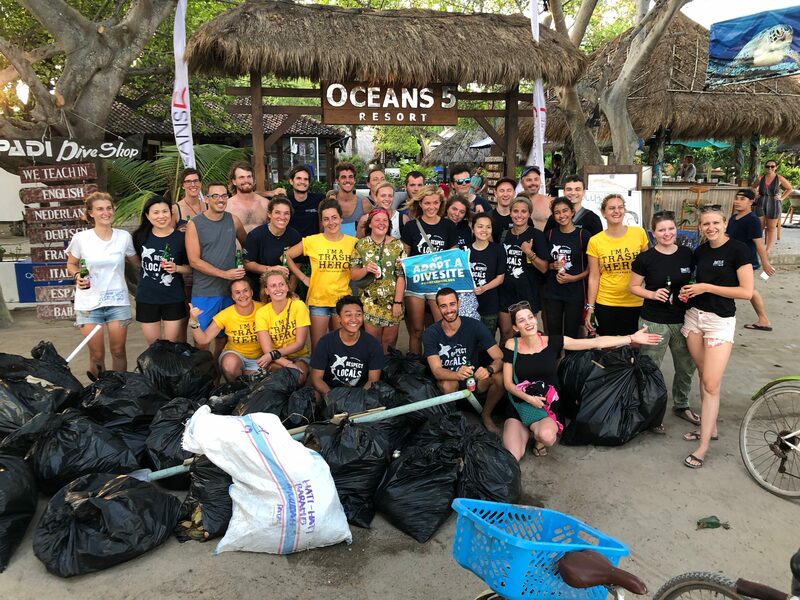 We dedicate every Saturday to the community, organising a variety of events from beach and island clean-ups to workshops. Everybody is welcome to join. Our research team attend as many activities as possible as well as hosting our own! Certified divers are welcome to join our Dive Against Debris every Friday morning on our adopted dive site, Meno Slope. We dedicate every Saturday to the community, organising a variety of events from beach and island clean-ups to workshops. Everybody is welcome to join. Between the various businesses around the island over 200 clean-ups have been organised, meaning that hundreds of trash bags have been filled and disposed of properly. We are all definitely working hard to maintain the beauty of our paradise home. We firmly believe that all these little difference put together will lead us to a better life quality, better environment and better future. We are honoured to be able to help the next generation, to be able to make a little difference in this world and a big one on our island. Never underestimate the small gesture, the small act, the small initiative because this is where all the meaning of our mantra “Little by little a little becomes a lot” comes from. We are now happily jumping into our second year of plastic free paradise. We always welcome new ideas and will gladly introduce them into our Plastic Free Paradise. Thank you for taking care of our paradise day after day. It means a lot to all of us! What’s More Likely To Kill You Than A Shark?